Anka Stalherm was born into a wealthy family in Recklinghausen, Germany, in 1897. She studied law and economics at Freiburg University. In May 1918 she met Joseph Goebbels. He immediately fell in love with the woman with the "extraordinary passionate mouth" and the "brown-blond hair" that lay "in a heavy coil on her marvelous neck." They gradually grew closer and became a couple. "Mine was a sense of fulfillment infinite and without measure." Their different backgrounds caused Goebbels problems: "Within it (the university) I was a pariah, an outlaw, who was merely tolerated, not because I achieved less or was less intelligent than the others, but simply because I lacked the money that flowed to the others so generously from their fathers' pockets." 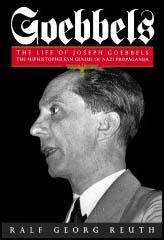 Toby Thacker, the author of Joseph Goebbels: Life and Death (2009) argues: "She was not his first girlfriend, but this was his first important relationship with women. For all that biographers and historians have pictured Goebbels as a young man filled with repressed hatred because of his disability, he was clearly very able to attract women of his own age. From the age of 15 he was more or less continuously involved with one or more women in intimate relationships. His whole mood and outlook fluctuated in sympathy with the changing fortunes of these relationships, which were invariably stormy, interrupted by difficulties with money, and beset with jealousy and misunderstandings. Goebbels' relationship with Anka Stalherm was characterized, like those that followed, by alternating periods of blissful happiness and bitter reproach." Anka's parents completely disapproved of the relationship. Her mother sent her to confession to rid herself of the sins she had committed with this "penniless cripple". In a letter to Anka, Joseph Goebbels told her that she should tell her mother this letter would be his last: "Perhaps she will forgive you then." His relationship with Anka made him more class-conscious. He became involved in discussions with trade unionists in Rheydt. He explained to Anka: "In this way one at least comes to understand the stirrings among the workers." He added that they have "various problems... really worth examining closely." Anka and Goebbels began to argue about politics. He wrote a letter to her in April 1920 where he expressed concern about the plight of the workers: "It is rotten and dismal that a world of so many hundred million people should be ruled by a single caste that has the power to lead millions to life or to death, indeed on a whim (for example imperialism in France, capitalism in England and North America, perhaps in Germany as well, etc.). This caste has spun its web over the entire earth; capitalism recognizes no national boundaries (witness the terrible, shameful conditions within German capitalism during the war, whose internationalism created a situation - evidence is available - in which, while battles raged, German prisoners of war in Marseilles were unloading German artillery pieces, marked with the names of German manufacturers, to be used to destroy German lives). Capitalism has learned nothing from recent events and wants to learn nothing, because it places its own interests ahead of those of the other millions. Can one blame those millions for standing up for their own interests, and only for those interests? Can one blame them for striving to forge an international community whose purpose is the struggle against corrupt capitalism? Can one condemn a large segment of the educated Sturmer youth for protesting against education's being made a commodity, inaccessible to those with the greatest ability? Is it not an abomination that people with the most brilliant intellectual gifts should sink into poverty and disintegrate, while others dissipate, squander, and waste the money that could help them... You say the old propertied class also worked hard for what it has. Granted, that may be true in many cases. But do you also know about the conditions under which workers were living during the period when capitalism 'earned' its fortune?" As Ralf Georg Reuth, the author of Joseph Goebbels (1993), pointed out: "As If the difference in the lovers' backgrounds had often created a tension overcome by the euphoria of love, the gulf created by Goebbels's socialistic views now seemed impossible to bridge. Despite the revolutionary turmoil shaking the Reich to its foundations, Anka Stalherm remained true to her bourgeois origins. The world from which she came offered her every advantage. A lover who showed enthusiasm for the Red revolution and actually seemed happy that her sheltered existence was threatened by political terror could not but appear more and more alien to her." Goebbels discovered that Anka was seeing another man. Dr. Georg Mumme, was a lawyer who lived in Freiburg. He wrote to her proposing they get engaged. "If you don't feel strong enough to say yes, we must go our separate ways." Anka rejected the offer and Goebbels noted in his diary: "Grim days. I shall be alone." Goebbels wrote another letter, this time threatening suicide. He told her that "I have suffered enough; how much more shall I have to suffer?" Anka replied that she promised she would remain faithful. Joseph Goebbels also got into debt and could no longer afford his university fees. In October 1920 he decided to commit suicide. He drew up a will, in which he named his brother, Hans Goebbels, as his literary executor. He meticulously enumerated his few possessions - an alarm clock, a drawing, a few books, bequeathing them to friends and members of the family. He instructed Hans that "his wardrobe and other possessions not otherwise assigned" should be sold, and that his debts be paid off from the proceeds. He told Hans that Anka should burn his letters and any other writings: "May she be happy and get over my death.... I part gladly from this life, which for me has become a hell." When his father heard about the will he quickly told him he would borrow the money so that he could finish off his university studies. When he heard the news he withdrew his threat. Anka Stalherm got married but it was not a success and in November 1927 had a child with another man. While visiting Berlin on 6th March 1928 she met Goebbels after the performance of one of his plays, The Wanderer. After he returned to his hotel she knocked on the door of his room: "Then the door opens, and before me stands - Anka Stalherm. I shake, I stutter, I quake with joy." Anka told him she was "unloved" and "joyless" and suggested they resumed their relationship. 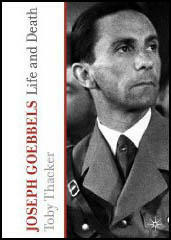 Toby Thacker, the author of Joseph Goebbels: Life and Death (2009) has pointed out: "He was captivated by her, as he had been almost ten years previously, and they met several times. According to Goebbels, she told him of her current difficulties; their continued love for one another was felt but not spoken. In April he introduced her to some of his Berlin friends and colleagues, the Schweitzers, Tonak, and his secretary use Bettge. He was doing a round of election speeches in Thuringia, and was able to call in Weimar to see Anka. She was, however, a respectably married woman, and it was clearly not easy for her to go out in public with Goebbels and his friends. When they called on her to go to the theatre, she made an embarrassing scene outside her house, and told Goebbels she could not go. Later, she turned up as he and his friends left the theatre, but although he tried to forgive her, he was wounded. The next day, in a long discussion, she confronted the prospect of separating from her husband to take up with Goebbels again, but stepped back from the brink. Goebbels was even introduced to her husband, and some of Anka's friends, and he was repelled. They were too bourgeois for his liking, and he wrote in his diary that Anka herself was, in the final analysis, a bourgeoise. He concluded that he could not help her." Alongside this developing artistic and intellectual consciousness, there were significant developments in Goebbels' emotional and sexual life. 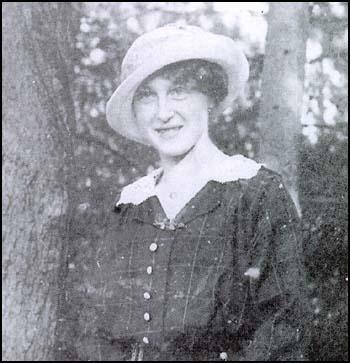 Most importantly, in May 1918, at Freiburg University he met and fell in love with fellow student Anka Stalherm. She was not his first girlfriend, but this was his first important relationship with women. For all that biographers and historians have pictured Goebbels as a young man filled with repressed hatred because of his disability, he was clearly very able to attract women of his own age. From the age of 15 (when he retrospectively recorded his "first love with Maria Liffers"), he was more or less continuously involved with one or more women in intimate relationships. His whole mood and outlook fluctuated in sympathy with the changing fortunes of these relationships, which were invariably stormy, interrupted by difficulties with money, and beset with jealousy and misunderstandings. 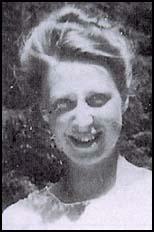 Goebbels' relationship with Anka Stalherm was characterized, like those that followed, by alternating periods of blissful happiness and bitter reproach. Most commentators on Goebbels single out his fascination for beautiful women, and typically highlight how, in his later life, he would abuse his position of power to gain their sexual favour, but this is to simplify hopelessly. As a young man his relationships with women also had other dimensions. His girlfriends, as well as being objects of unfulfilled sexual longing, were sounding boards for his passionate, strongly articulated but incoherent views on life and art. The women he was most closely involved with as a young man, that is to say Anka Stalherm and Else Janke, were, fortunately for them, strong-minded and capable, and both succeeded in keeping him at arm's length. If the difference in the lovers' backgrounds had often created a tension overcome by the euphoria of love, the gulf created by Goebbels's socialistic views now seemed impossible to bridge. Despite the revolutionary turmoil shaking the Reich to its foundations, Anka Stalherm remained true to her bourgeois origins. The world from which she came offered her every advantage. A lover who showed enthusiasm for the Red revolution and actually seemed happy that her sheltered existence was threatened by political terror could not but appear more and more alien to her. It is rotten and dismal that a world of so many hundred million people should be ruled by a single caste that has the power to lead millions to life or to death, indeed on a whim (for example imperialism in France, capitalism in England and North America, perhaps in Germany as well, etc.). This caste has spun its web over the entire earth; capitalism recognizes no national boundaries (witness the terrible, shameful conditions within German capitalism during the war, whose internationalism created a situation-evidence is available-in which, while battles raged, German prisoners of war in Marseilles were unloading German artillery pieces, marked with the names of German manufacturers, to be used to destroy German lives). Capitalism has learned nothing from recent events and wants to learn nothing, because it places its own interests ahead of those of the other millions. Can one blame those millions for standing up for their own interests, and only for those interests? Can one blame them for striving to forge an international community whose purpose is the struggle against corrupt capitalism? Can one condemn a large segment of the educated Sturmer youth for protesting against education's being made a commodity, inaccessible to those with the greatest ability? Is it not an abomination that people with the most brilliant intellectual gifts should sink into poverty and disintegrate, while others dissipate, squander, and waste the money that could help them... You say the old propertied class also worked hard for what it has. Granted, that may be true in many cases. But do you also know about the conditions under which workers were living during the period when capitalism "earned" its fortune?